SysTools Outlook Cached Contacts Recovery software is meant for the recovery and restoration of contacts save in corrupt NK2 file. The contact information from NK2 file is completely recovered with no data loss. It can then be restored as PST format file. Built with swift data recovery algorithms, the software is extremely time saving too. Works fast and yet renders easy to process steps for recovering contacts from Outlook cache. No amount of data loss / damage is involved. You can use this software as an NK2 file reader as it allows you to open and view NK2 files. Once you have viewed the recovered contact information in NK2 file, you can proceed to saving it in MS Outlook PST file format. This recover and restore Outlook NK2 file utility shows a detailed preview of the contact information stored in an NK2 file. This information is arranged in an alphabetical order on the software preview panel that offers a convenient view to the users. Supportive is provided to all available versions of MS Outlook including; 2013, 2010 (32 & 64 bit) and below versions as well. Also, the tool offers full support to all Windows Operating System editions. This includes Windows 8, Win7, and below versions too. Trial version of Outlook Cached Contacts Recovery software view complete contact information of NK2 files. Can I install this product on my Windows 8 system? Yes, this software can be installed and used successfully on Windows 8 Operating System and all other versions too. Please launch the tool as "Run as Administrator" if you are using Windows Vista, 7 or 8. Is Outlook environment necessary for running this tool? Yes, Outlook must be installed and configured properly on the respective system for operating this tool. However, you can use any version of Outlook (32-bit). Will I be able to repair NK2 file using this software? Yes, software recovers contacts from NK2 file which have been deleted or corrupted and lets you save them back to PST as Outlook contacts. How does the software recover Outlook cached contacts? Software works in a very simple and fast manner. It loads all the cached contacts from your default Outlook profile and shows them in alphabetical order on the right panel of tool interface. Further, you can save all or selected contacts back into your Outlook profile. What if any kind of trouble is experienced during recovery? If you face any issues while working on the software please contact our Support Team. They are ready to serve you 24*7. Can the software be operated without any technical know how? I don't have any technical knowledge. Can I still use this product or do I need to have any prior knowledge about this software? Yes, you can operate the tool without even having any prior knowledge about it. There is no need to have any advance technical expertise on using this product. Its highly interactive and user friendly interface ensures that ease is experienced while using it. What is the location of NK2 file in Windows XP machine? Being a hidden Outlook data file NK2 files aren't directly accessible and we were facing problems with complete contact information not being displayed. 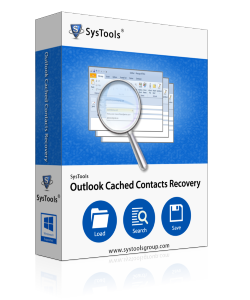 Thanks to SysTools Outlook Cached Contacts Recovery tool, we not only found out about its corruption but also restored it in an easily accessible PST format. NK2 files are a concept far behind the knowledge of a common Outlook user. Thus, I faced a lot of problems when found out about NK2 file corruption resulting in incomplete contact information. Thanks to the support team for assisting me NK2 file location and its restoration in PST file via Outlook Cached Contacts Recovery.